I love to travel. I mean - who doesn't, right? As I am still on a high from my last adventure, I am so excited to post the travel organizers and stuff that I cannot travel without! Because I tend to carry a lot of things when I travel, organizing these items is a must. And I mean a whole lot! "Travel-light" seems to be an alien concept for me, though lately I've been trying so hard to travel with less. I guess it's a contradiction to the inner girl scout in me - be always prepared! Anyway - the trying-hard OC that I am, I try to keep everything organized and cIutter-free as possible. I mean, who would want to open their bag with so much mess and not to mention the horror of all horrors when you have to open it in front of many people - with your stuff in a jumble here and there? Plus, it'd definitely be a huge pain looking and scrambling for items. Stylish and organized. Anma certainly knows a traveler's needs! With compartments for currency, passport, tickets and documents, and many more, this leather wallet is all you need when you check-in and go through immigration. It comes with a handy-dandy pen holder too. I love that these come in very pretty colors and can be personalized with your monogrammed initials too. No fuss, it's named for what its purpose is - to be the bag inside the bag! 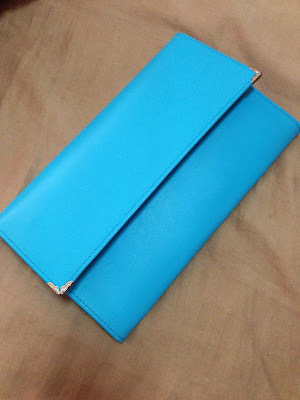 It comes in different yummy pastel colors, and very helpful to organize the things we put in our luggage bags. What could be more embarrassing that have your luggage opened up in customs only to have people see the mess inside your bag! 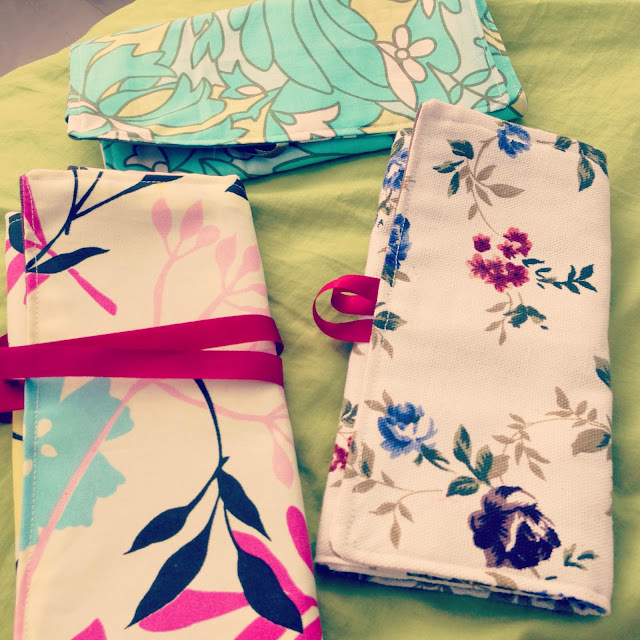 It comes in different sizes, perfect for both cabin and luggage bags. As an added bonus, it's made of mesh on one side so it's easy to see what's inside. Beauty Bar's toiletry cases are a personal favorite of mine. I simply couldn't resist dropping by their store from time to time to see if they have new designs. Sturdy and of good quality, with a variety of girly designs and styles to choose from, this is a treat especially when you need to carry a lot of essentials when traveling. I like that the outside part is made of durable plastic so I just bring it with me in the shower (it comes with a hook too!) and I don't have to worry about damaging the toiletry bag. Truth be told, it's hard to find good toiletry cases and this is a winner for me. 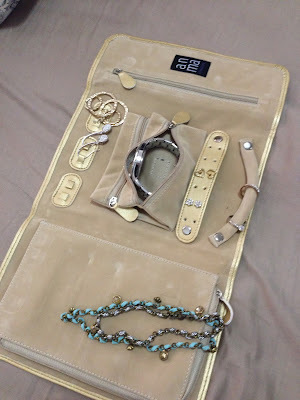 I tend to bring only a few, selected and staple jewelry items when I travel because I don't really have an organizer and I don't like the idea of just tucking my jewelry here and there. Mom gave me some pill boxes to store in small jewelry and small knick-knacks like safety pins, hair pins and hair clips. This actually works and serves its purpose since I can bring the small pillbox with me too. Perfect when I have to take out my jewelry and go swimming or to the gym. 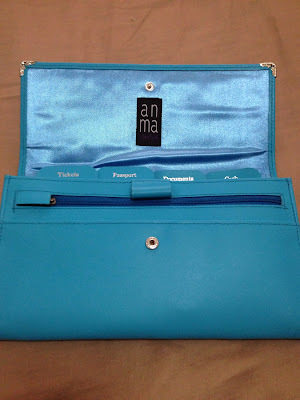 For more organized jewelry for traveling, though, this wonder product from Anma is love. With compartments for watches, rings, earrings, bracelets and necklaces, this is a girl's best friend. Ever since my love-affair with makeup and brush rolls, I can't go anywhere without them. Luckily, with these cutie canvas brush rolls, I don't have to be without them. Most makeup brush sets come with cute brush rolls too and I just can't get over the hot pink brush roll that came with my pink Charmed brushes. How about you, what are your travel must-haves and travel organizer finds?